B-b-b-b-biscuits, y’all! If there is anything sacred here in the South, it’s the biscuits. Every family has their own secret recipe, special way of preparing it, or twist on the classic favorite. Mine is no exception to that standard. 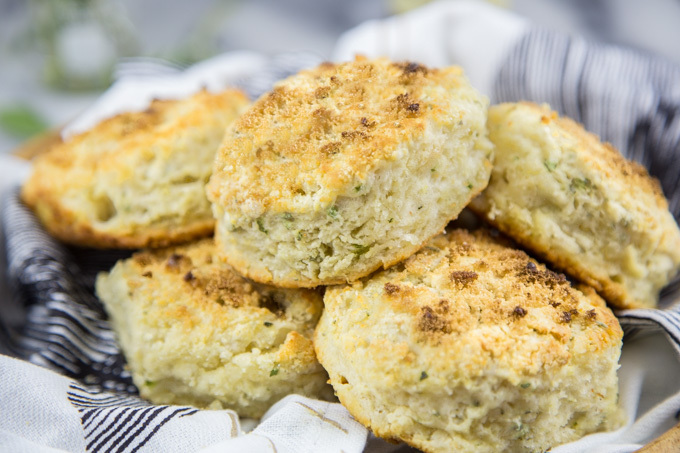 A good biscuit can be transformed into a savory side for dinner or even a sweet base for dessert. Since I usually focus on the sweeter side of life, I decided to try out something a bit more savory. All right. Stop (collaborate?) and listen, y’all. I’m gonna say it. These are my FAVORITE biscuits that I have ever. made. ever. ever. ever. in my entire life so far. Like… I can’t even begin to explain what happened when I made these for the first time and they came out of the oven. I knew it would be a decent biscuit, but I didn’t know that it would become my all-time new favorite. Sage isn’t something I cook with enough, really. I have a hearty little sage plant that is still kicking along, but I just sorta let it grow and look pretty. I like the furry looking little leaves, but haven’t ever been the biggest fan of the flavor. I don’t hate it (like I do mushrooms, olives, most chocolate… #picky), but it just isn’t something I would ever crave. Now that I’ve made these biscuits, that poor sage plant will probably be neeked at the end of the month. No. It will still be 70 degrees here probably (thanks, global warming), but I’ll have used every single fuzzy leaf by then on waist-friendly (kidding.. don’t sue me) biscuits. Along with the savory sage, I added type types of Nielsen-Massey Vanillas into the biscuits. Vanilla isn’t just for sweet baking, cookies, cakes, etc. It’s sorta like salt, in that it can seriously help to bring out the savory side of fresh herbs and spices. 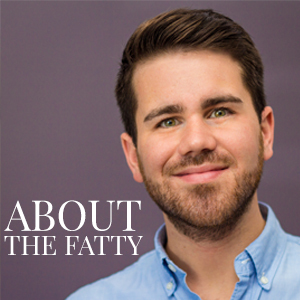 If y’all read my blog EVERY DAY (like I know you do, right? ), you’ll know about my love affair with vanilla bean paste. 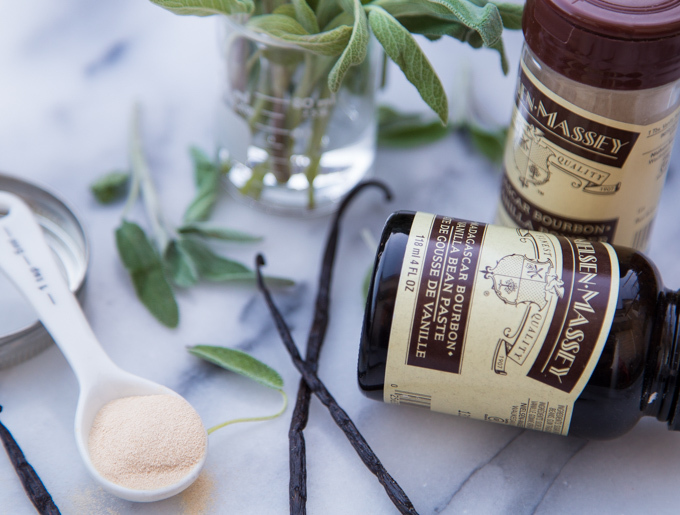 You won’t find a single ounce of that fake vanilla extract in my kitchen. There just isn’t any need for it. Ideally, I would have my entire patio fence covered in vanilla vines. Since I sadly don’t have that at all, I almost always opt for vanilla bean paste. You measure it 1:1 like you would extract in recipes, it leaves you with real vanilla bean in the recipe, and the taste is just superior in every way to general extracts. High-quality extracts are also great, but I really love to see those vanilla specs in the final product. Nielsen-Massey is my go-to. I’ve worked with their products for years, and they are by-far the leader in the vanilla world. There is no doubt when I stock up on NM products that I am going to get quality every single time. Not to mention, they are a company with a fantastic history of over 100 years of experience. PS- They also make Vanilla Bean POWDER (right???) that I am also using in this recipe. 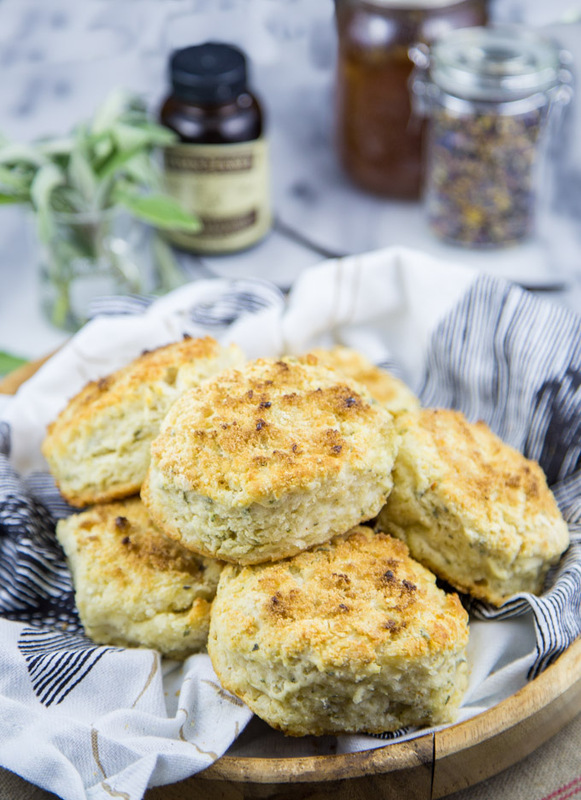 With hope that my southerner card isn’t revoked, I’m going to give you some of my best biscuit secrets. The base of my biscuits is super-simple. It’s all in the technique. Cold, cold, cold! I literally freeze every ingredient for biscuits for the best result. Mix together all of the dry ingredients and pop it into the freezer. 10 minutes. It’s not a huge commitment or anything. I keep butter in my freezer just for this. The biggest mistake you can make in a southern kitchen is sending out flat biscuits. You want these things to be tall. I’m talking Trump’s border fence tall here. You accomplish that with a combination of a few things– the proper ratio of baking powder, soda and salt, and butttttaaaaaa. Butter always makes everything better. The important part is that you don’t want your butter to melt a single bit until it hits that screaming hot oven. The bits of butter between the flour creates layers. Layers like I should be wearing since it’s December and all. Grating is my answer to this. Sure, you can cut it in with a knife, pastry cutter, food processor. I’ve found that grating the frozen butter directly into the frozen flour mix is absolutely the way to go. Every other way just risks heating it up a bit. That tiny bit of heat means one less layer in your biscuit. Nobody has time for that. 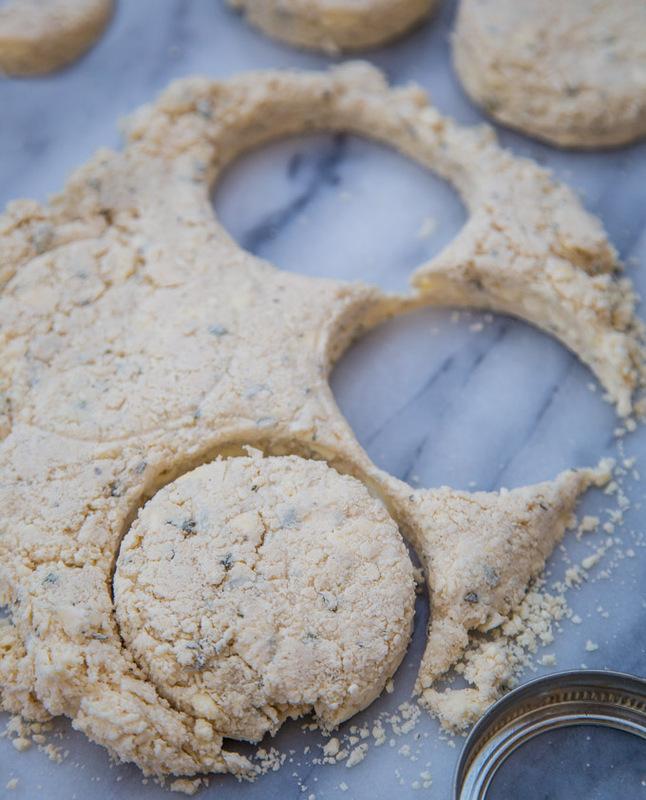 Like a tiny majestical top hat for our biscuits, I add a teensie bit of brown sugar and vanilla bean powder over the tops before I bake them. I don’t brush these with butter or cream or anything like that. They just don’t need it. 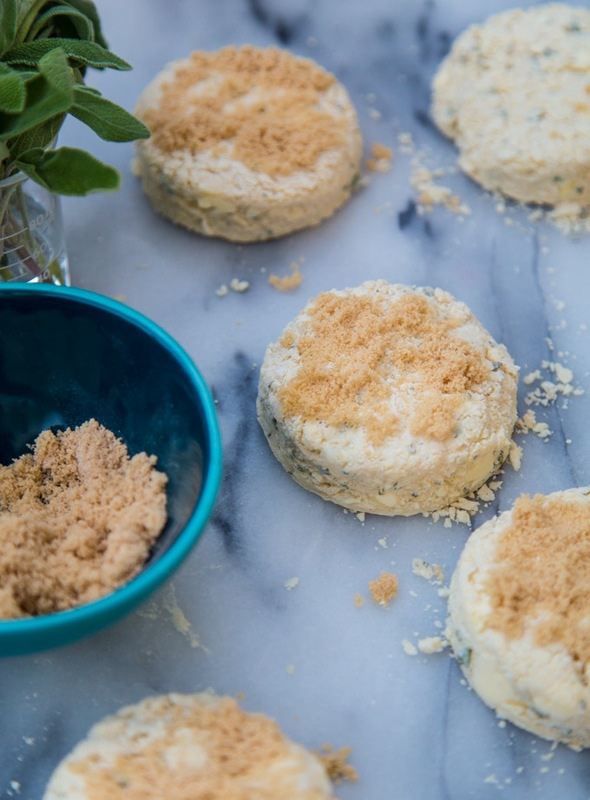 The brown sugar vanilla powder mixture will caramelize into the biscuit top and leave you with a hint of sweetness before you dive into the savory biscuit. You’ve gotta have that balance if you want a perfect savory side. It’s not complicated. Great quality ingredients make for great quality food. The hints of rich sage combined with the vanilla in the biscuit base, the tiny hint of sweetness in the brown sugar & vanilla powder topping. It just make for the best biscuit you’ll ever have! Pre-heat oven to 500 F.
Whisk all dry ingredients together in bowl. Place bowl in freezer for 10 minutes. Place tablespoon of butter in skillet. When flour mixture is very cold, remove and grate frozen butter into bowl quickly. Stir gently to combine. Add in buttermilk and vanilla bean paste and stir gently until justo combined. Place skillet into oven with the tablespoon of butter in it to warm. Turn onto lightly floured board or counter-top. Press into a rough rectangle or large circle. Be light with the dough. When pressed to about 1" tall, use biscuit cutter (3" is my choice) to cut out biscuits. 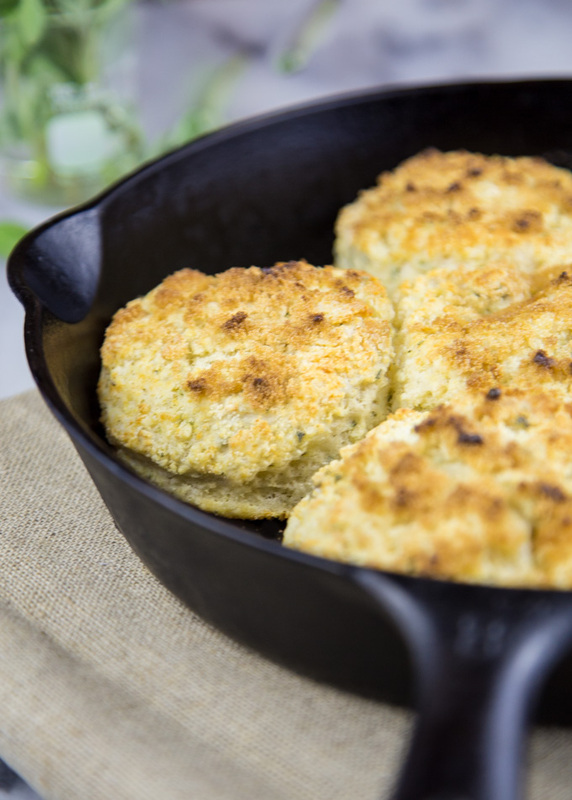 Carefully place biscuits into hot skillet. Remove and cool to enjoy. I enjoyed these with a great leek mushroom soup! Also great with a sweeter addition, like jam. Disclosure: This post was made possible by a partnership with Nielsen-Massey Vanillas. I created and posted this recipe because I truly love the mentioned products. Love the mix of flavors in these! Right?! Unexpected, but really great together. Shut the front door! These sound divine. Add this to the list of things you’re a gonna make me. Done! Seriously the best. Emma make a bunch next week and deliver them like a milk man. Oh my goodness, do these biscuits sound delicious! I’ve never, ever, ever thought to add vanilla to a savory dish before to bring out the herb-y goodness, and you’d better believe I’m going to try now. Great idea! Honestly. Best evvaaaah! I include vanilla in a lot of things more to bring our other flavors than add vanilla itself. Works great in some unexpected combos.